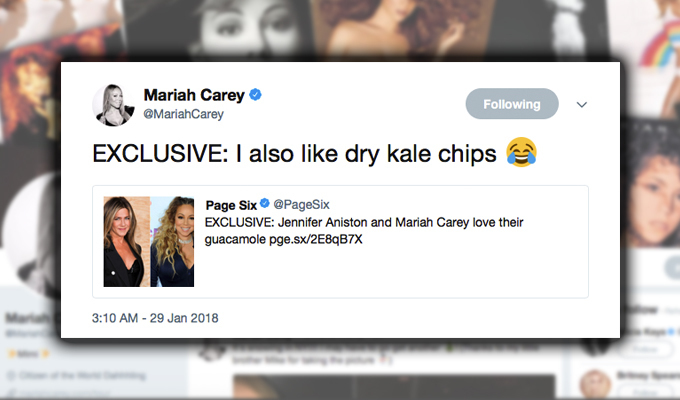 Mariah Carey may be a diva, but she’s also a little bit of an Internet troll: Earlier today, she poked fun at a Page Six headline that proclaimed she loved guacamole. The sentiment isn’t an exaggeration. Not only are celebrity endorsements a frequent advertising tactic, but even a casual mention can skyrocket a product’s popularity. Take Prince George: After reports that puy lentils were on his school’s lunch menu, there was an uptick in puy lentil orders. (Still no word if the little prince actually likes them.) So, will kale chips see an upswing? They just might (Vogue, for one, has been spreading the good word about the vegetable for a while now). It also raises another question: Is Mariah Carey becoming one of Twitter’s best celebrity personalities? The face of the beloved “I don’t know her” meme captivated the Internet a few weeks ago when she accidentally took Meryl Streep’s chair at the Golden Globes—and effusively tweeted about her mistake. With a location tag of “Citizen of the World, Dahhhling,” it seems that Carey knows exactly how to give the people what they want.